Figure 1, Components to MOS capacitance. For p-type silicon, we can ignore n, the number of electrons in the material. The number of holes is primarily due to the number of acceptors in the material, so we can replace p with NA. Therefore, in flatband, the silicon capacitance per unit area is simply the dielectric constant divided by the Debye length. One way to think about this is the Debye length is the distance over which carriers still feel disturbances. So, to summarize our analysis of the high-frequency CV plot for an ideal MOS structure, there are three regions of interest: accumulation, depletion, and inversion. In strong accumulation, the majority carrier concentration increases rapidly at the surface, causing the Debye length to decrease and the capacitance in the silicon to increase. As the structure goes further into accumulation, the capacitance will increase to a maximum value around the capacitance of the oxide. As the magnitude of the accumulating voltage decreases, the majority carrier concentration decreases at the surface, causing the Debye length to increase and the capacitance in the silicon to decrease. In depletion, the depletion width increases, causing the capacitance in the silicon to decrease. It will continue to decrease below the flatband capacitance. In strong inversion, the inversion layer shields the sub-surface from the metal field lines, The depletion width saturates at X sub d max, the silicon capacitance at C sub silicon min, and the overall MOS capacitance at C sub min. It should be noted that the inversion layer forms only when the inversion carriers are provided by electron-hole pairs or injection from the junction. Stay tuned for the conclusion of this article in August! In reliability circles today, design for reliability receives a lot of attention. Within this discipline, there are a number of researchers developing compact models for reliability degradation. What exactly is a compact model? 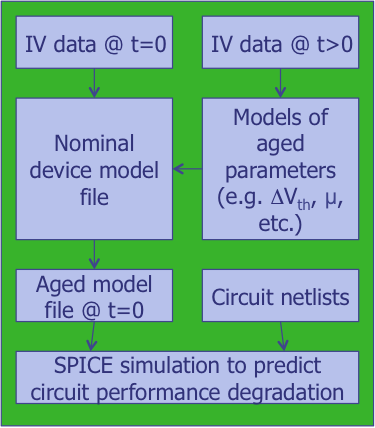 A compact model is a simplified way of thinking about a reliability degradation mechanism in terms of an input to a standard simulation tool, like SPICE. One would take reliability measurements on test structures to get data. This could be a failure mechanism like Negative Bias Temperature Instability (NBTI), Channel Hot Carrier (CHC) Degradation, Time-Dependent Dielectric Breakdown (TDDB), etc. One then fits the data to parameters that exist within the model, like threshold voltage, mobility, etc. The parameters are measured at zero stress and after stress. This forms the basis for nominal parameters and aged parameters. These parameters can then be used to simulate the behavior of standard cell libraries, or analog/mixed signal blocks. 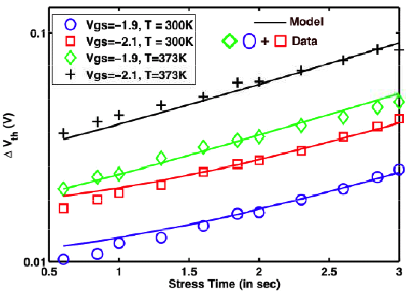 The results would then show behavior before and after stress conditions for various circuits. These changes can then be used to predict larger effects that might occur at the architectural level in the IC. Q: We are using the growth equation (see Excel GROWTH function for details) to model degradation in InGaN laser diodes. Is this approach acceptable for prediction purposes? A: Using the GROWTH function in Excel presumes that the degradation process will be slow and noncatastrophic. While this approach might be acceptable on a mature process line where no catastrophic degradation occurs, it is quite dangerous to make this assumption across all device types or technologies. Some devices can degrade gradually for a period of time and then exhibit a dramatic, or catastrophic decrease in output.